The Pilgrimgram: A little bit of self disclosure. Or maybe an explanation. A little bit of self disclosure. Or maybe an explanation. You’ve probably already figured out that my first name isn’t actually “Northwest” and that I’m not really Gandalf the Grey. This is a “pen name” (“A pen name, nom de plume, or literary double, is a pseudonym adopted by an author.” ~Wikipedia). Pen names, of course, are not uncommon. Stan Lee (born Stanley Martin Lieber) to Mark Twain (Samuel Clemens) and George Orwell (Eric Arthur Blair) all wrote under pen names, though for different reasons than I do, I’m sure. ● For the vast majority of people who read my writing, there is no functional difference between knowing me as “Todd” or as “Nor’west.” Whether you know my name or not, you don’t actually know me. Knowing me only comes through relationship, not through names. Get to know me, and then you'll know me, regardless of the name you know me under. ● Some people want to say, “But that doesn’t tell me anything about you!” Those people aren’t paying attention: knowing my name doesn't tell you anything about me either. On the other hand, a fair bit of my calling is to build up the prophetic gifts in the Pacific Northwest region of the US, the area that geologists and sociologists call Cascadia; that’s where the name comes from. Facebook wouldn’t take “Northwest” as a first name, so we go with “Nor’west,”a nautical term that means the same thing. That certainly says more about who I am than “Bill Smith” ever would. ● I’ve run into a fair number of people who want to know my name simply to exercise some sort of power over me, whether imagined or real. I’ve walked this walk long enough to know that the enemy of our soul is real, and has real followers. I’ve found enough sacrificed animals to decide I don’t want to be part of that stupidness. ● I’m not, as some have feared, trying to accomplish some nefarious purpose with this pseudonym. If that were my goal, I’d need to do something nefarious, and no thank you. Besides, I don’t like doing things I’d need to repent of later. ● More important to me, I’ve watched many believers work for the Lord, but build up their own name. I’ve met so many “ministers,” who are quick with their business card, announcing that they’re the founder and apostolic leader of “Fredrick J. Fuffenfuffer Intergalactic Glory Network” or some such foolishness. It is my opinion that there’s only one Name that needs to be magnified, and let's acknowledge, it isn’t mine. ● Perhaps you’ve heard the stories about the children of Christian leaders? They’re called “PK’s” (Preacher’s Kids) or MK’s (Missionary’s Kids). One of my best friends growing up was a PK, and I watched as he lived up to (down to?) the nasty reputation surrounding the name. There is a stupid amount of social pressure placed on the children of known church leaders. I determined not to do that to my treasured children. Frankly, I think it’s sad how many amazing kids are sacrificed on the altar of a parent’s ministry or career or public image. My children are in full agreement with my anonymity and the reasons for it. ● The only folks who are treated worse than PK’s are Pastor’s Wives. I’ve been a pastor much of my life. If you knew the treasure who is The Lady that has, at great personal cost, gloriously lived out her vows about “for better or for worse,” then you’d understand why I don’t care to force her, against her will, into a fleshly limelight that glorifies people instead of God. It’s repugnant to both of us. I will not knowingly ask more of this from her. ● A few people have been concerned that I’m not accountable. That’s silly. I’m just not accountable to them. I have a number of godly men (and one beautiful bride) whom I trust completely, and to whom I make my life as open a book as I am able. I reserve that kind of relationship for folks who have walked many miles through stinky places with me, and I’m not actually looking for new accountability partners at this time. 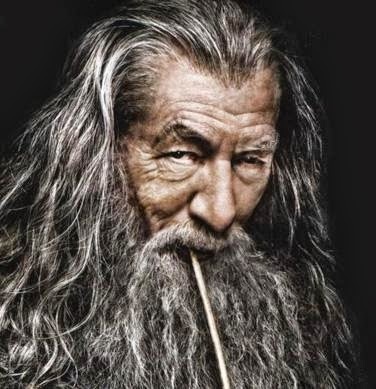 ● I’ll tell you how the Gandalf image came about: over the years. (I use his image as an avatar on Facebook and other social media sites.) 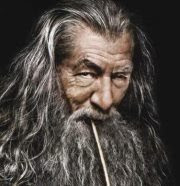 Over the years, I’ve used a number of photos as avatars (http://on.fb.me/1119FTZ ); one time when I changed my image from Gandalf to something else, a lot of people fussed and wanted Gandalf back. OK, sure. Since Gandalf has, as I do, has long hair and a big ol’ beard, and since he doesn’t come with all the social baggage of the other bearded guy (Hint: Ho, Ho, Ho! ), I stuck with it. I admit, I've been inconsistent, if only to save me from having to come up with new faces every few weeks. Besides, I love who Gandalf is in the books wherein he appears. If you want to know more about me, then read what I write (I do write under this name for several blogs; they’ll generally post to Facebook automatically, so that is where you’ll find the biggest selection.) Feel free to dig through my archives in this blog and on Facebook, and read what I write about. Listen to see if God speaks to you there (that is, after all, the goal). Or you may ask other people about me (but please honor them [and me] enough to NOT ask them private details, like my name or my family life). If you want to really know me, join in the conversation, though understand that I’ll be far more receptive to it in the public arena, particularly on ongoing threads on my wall. As a matter of policy (and honor for that treasured lady I mentioned earlier), I generally don’t engage in private conversation with women. If all of this offends you, that’s actually OK. God has given both of us a free will, and you’re completely free to choose not to be in relationship with a strange old guy with hidden face and a funny name. God bless you as you follow Him along the path He’s leading you on. This is the path He’s leading me on. I really like walking with him, so I’m going to stay on this path, because that’s where I find him. If any of the insights from my path help you on yours, then we’re both richer for it, aren’t we?